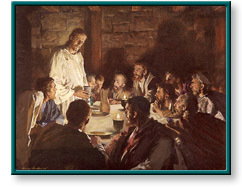 The Last Supper and other artwork by artist Harry Anderson can be viewed in our artist slideshow. The Last Supper by artist Harry Anderson and other Harry Andersen art, art work, artwork, canvases, giclees, images, limited editions, open editions, paintings, paper, pictures, posters, and prints can all be found at Christ-Centered Art. The Last Supper depicts Jesus holding the Passover seder cup and giving thanks. Add $6 for shipping & insurance. This unframed open edition paper print comes mounted and is ready to frame. The Last Supper by artist Harry Anderson as well as other open and limited edition Jesus paper art prints and canvases, giclees, images, lithographs, paintings, pictures, posters, and reproductions by renowned Review and Herald Publishing Association artist Harry Anderson can be viewed and purchased at special sale prices at Christ-Centered Art.